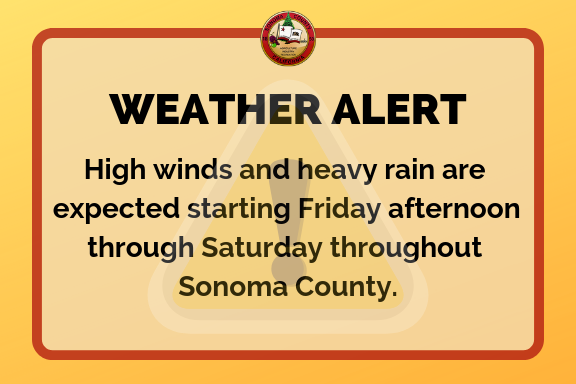 Sonoma County has issued a weather alert (below), warning of high winds and a short, but intense period of rain for the Sonoma County area beginning Friday afternoon. Free sandbags are now available to City residents at City Hall during normal business hours, limit 10 bags per resident while supplies last. Additional bags are available for purchase at Friedman’s Home Improvement Center (1360 Broadway). Heads Up Sonoma County Residents! Starting this Friday afternoon, a Cold front will be moving to our area, bringing high winds and a short but INTENSE period of rain. • HIGH threat of wind related problems, including falling trees and power outages. • HIGH threat of localized flooding. • HIGH threat to commute traffic. • MEDIUM – HIGH risk of mudslides (Likely to see slippages in the Burn Scar Area). ● Avoid walking or driving through flood waters. Turn Around, Don’t Drown! ● Drivers are encouraged to observe road closures and use detour routes. Road closures and restrictions information for the unincorporated areas can be found at roadconditions.sonoma-county.org. Please call Transportation and Public Works at 707-565-5100 to report a road obstruction from 8 a.m. to 5 p.m., and the Sheriff’s Office at 707-565-2121 after hours. Please share with family and friends for awareness! 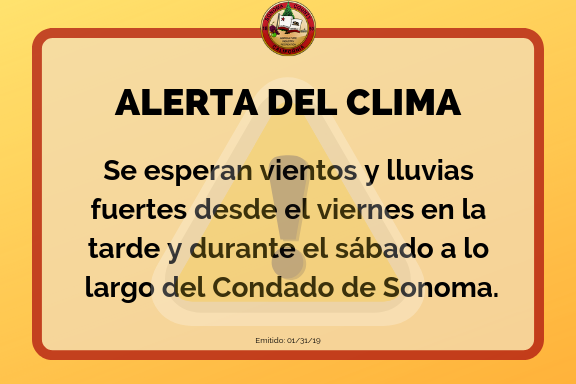 ¡Atención Residentes del Condado de Sonoma! A partir de este viernes en la tarde, un frente frio se moverá hacia nuestra área trayendo fuertes vientos y un periodo corto pero INTENSO de lluvia. • ALTO riesgo de problemas causados por el viento, incluyendo árboles caídos y/o cortos eléctricos. • ALTO riesgo de inundaciones localizadas. • ALTO riesgo de impacto en carreteras durante horas pico. • MEDIANO – ALTO riesgo de derrumbes (Posibles deslizamientos en zonas quemadas por incendios). • No maneje ni camine en áreas inundadas. ¡De la vuelta, no se ahogue! • Se les pide a todos los conductores que se informen sobre los cierres de carreteras y desvíos en su lugar aquí: roadconditions.sonoma-county.org.También pueden llamar al 707-565-5100 para reportar obstrucciones en las carreteras durante horas de oficina. Pueden llamar a la oficina del Alguacil del Condado en horas irregulares al: 707-565-2121. ¡Por favor compartir con familia y amigos para que se enteren!